This isn’t too surprising at all, since as technology continues to improve, people will always try to come up with new ideas on how to bring aspects of civilized life to the outdoors. 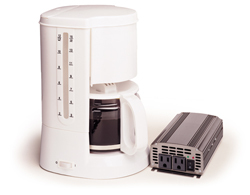 One such example of a battery coffee maker is the Roadpro RPIC-609. It looks like a normal 12-cup automatic drip coffee maker, and is used just like a normal 12-cup coffee maker. However, the only difference is that it can be hooked up to a car battery in the same way we attach jumper cables to a car battery. The unit comes with an 800 watt power inverter. Plug the coffee maker into the inverter, and connect the inverter to a car battery. By doing so, the coffee maker is supplied with the energy that it needs to function. The 800 watt power inverter also indicates whenever the car battery is running out of power through a low voltage alarm. Now who says you can’t use an automatic drip coffee maker while you’re outdoors? The main advantage of having a battery coffee maker is, of course, its ability to function wherever you may be, as long as you have a supply of batteries with you. Being able to bring a piece of civilized life with you during camping trips can be quite convenient. The thought of being able to enjoy brewed coffee from an automatic drip coffee maker may have been an impossibility, but imagine how easy it would be to brew a cup, even 12 cups of coffee with the Roadpro RPIC-609. However, once you run out batteries, the coffee maker is deemed useless. And it may be too cumbersome to lug a 12-cup coffee maker with you, let alone a stack of car batteries during camping trips. To be quite fair though, this technology hasn’t been around for a long time, and if given the time to develop and improve, we might see a whole line of more portable and energy efficient battery coffee makers. Imagine being able to brew shots of espresso from a battery powered DeLonghi coffee maker or being able to enjoy coffee from a Bunn battery powered coffee pot. For a camping purist, though, the thought of bringing a battery powered modern coffee maker and using it outdoors somehow defeats the purpose of camping in the first place. Isn’t camping all about being able to enjoy nature and live life in the outdoors with just the bare necessities?